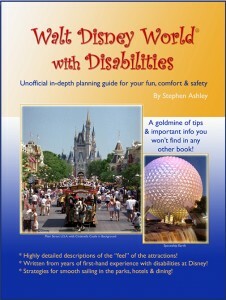 “Walt Disney World With Disabilities is a must read. While the title may lead you to believe that this is a guide for those with severe disabilities, it really is a guide for anyone. Not only will you get useful information for those who are wheelchair bound, but also you get great tips for those with more “minor” disabilities such as motion sickness or allergies. This book contains various tips for hotels, parks, shops and restaurants. It also includes links to helpful websites as well as phone numbers for contacting the resort for any questions you may have about meeting specific needs while on vacation. 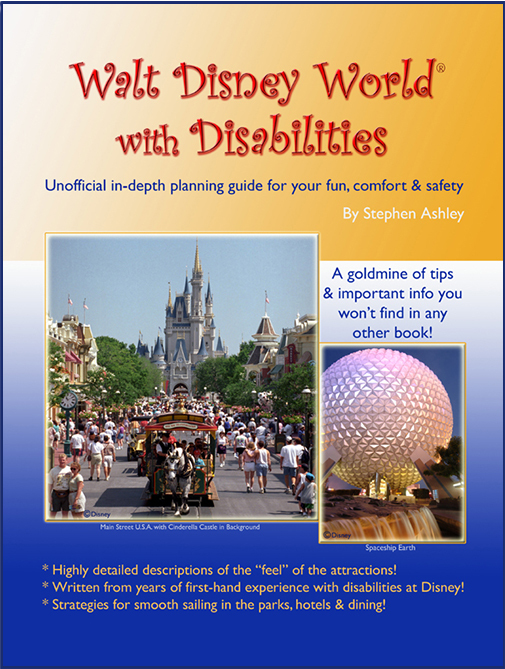 “In my opinion Walt Disney World with Disabilities is the best book out there for anyone with a health condition. We own several Disney guide books including another one designed for special needs at Disney. Nothing else I’ve read describes the way the rides feel as well as this book does. The writers really paid attention to every sensation and experience, and they share it all in an easy to read and understand style. It’s also packed with useful and practical suggestions for the parks, resorts and dining. I also highly recommend this book to parents who wish to choose appropriate rides and shows for their children. Really it’s great for anyone who wants to know what a ride feels like before trying it. I’ve gone to Disney many times over the years with my wife and kids. One of the things that I’ve found most challenging is deciding which rides are suitable for my children, and for me. It can be really confusing sometimes, because the Disney warnings are all encompassing. For example, many ride warning signs say that a person with back or neck problems should not ride. Yet some of these are fine for me. This book really gives you a sense of the true intensity and experience, and I find the descriptions to be right on target. “…Please continue to provide this information to those out there that feel they could never go on such a big trip. All it takes is some careful research, creative thinking, and you’re in for the time of your life. I hope you do some more theme parks, national parks, and other vacation ideas for the disabled… Our trip was such a joy and a nice break from the confines of my medical condition. I have proven to my doctor that end stage renal disease does not have to keep me from getting back out into the world. “This book should be called Walt Disney World for Everyone! I think everybody should read this book who wants to go to Disneyworld. I started reading it as an Occupational Therapist, but I found myself to be really riveted by the wealth of information that applied to me personally and to my family. As a mother of 6 kids, I really believe that these are the things a mother really wants and needs to know. This book is so thorough. Its an A-Z guide that has things you wouldn’t think to even ask about that were so helpful, and it will help parents make important decisions. For example, you don’t want to spend time in lines for attractions that won’t be good for you or your kids. The descriptions were so good that they really helped me know what would and wouldn’t be worth our time. And those lines can be tough to wait in with impatient and tired kids! The book helps you plan your day so you get the most out of your time, and it will save me hours of waiting in lines for rides that would have turned out badly. There’s so much useful information like this that will help our family be so much more comfortable. I think it will also be fantastic for people with health problems. My husband can’t do a lot of walking and there were services for him that I had no idea about. “I discovered this great book last Spring, and I love it so much I’m ordering the revised edition! Mr. Ashley does a wonderful job in explaining what to expect. On our last visit to Disney World, my sister, who has Down’s Syndrome and isn’t able to walk long distances, came along. This was our first experience dealing with a wheelchair at Disney. 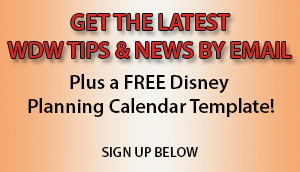 While it is very true that Disney World is probably the best place to vacation if you or a family member has disabilities, the amount of knowledge needed to easily navigate all the parks, shops, restaurants, and attractions is immense. Other guide books were helpful, but oh how I wish I had had this one then! It literally takes you through each attraction and park and tells you how to manage, not only with a wheelchair, but with other health issues also. We go back in January, and I’m looking forward to a much more relaxed and fun trip this time! Thank you Stephen and Sarah for sharing your experiences! “I manage a home health agency in South Florida and have many disabled clients that I felt would benefit from this book. I just finished it and was very impressed with its explicit content and wide range of disabilities it addressed. For anyone who knows someone with any type of disability or medical problem and is planning a trip to Disney World, I would recommend this as a great resource. The reader learns how to make the event as smooth and carefree as possible. I found it also ideal for the elderly person who wants to remain active and get the most out of their visits! We really appreciate your comments! We can reference you by using your first initial, last name and state, or we can use your initials and state if you prefer. Please let us know your preference. Please be aware that by sending us your email, we reserve the right to print its’ contents on our website, and in our current and future books.